With it being a little bit cooler and rainy around Central Florida the past few days I was in for something rustic and homey to prepare for the visitors here. My boyfriend pointed out that in the past I had made some very good bread while in culinary school and he missed it. This led to me realizing that I really lack making bread not just for blog posts but in general. This sent me on a mission to find a formula that would lend the house a yeasty fresh baked loaf scent but also unique enough that you wouldn’t just look at this post and feel like you could have easily went to the supermarket and picked yourself up the same thing in the bakery minus the hassle and dirty dishes. So here is what I found… the Bonnet Biscuit. 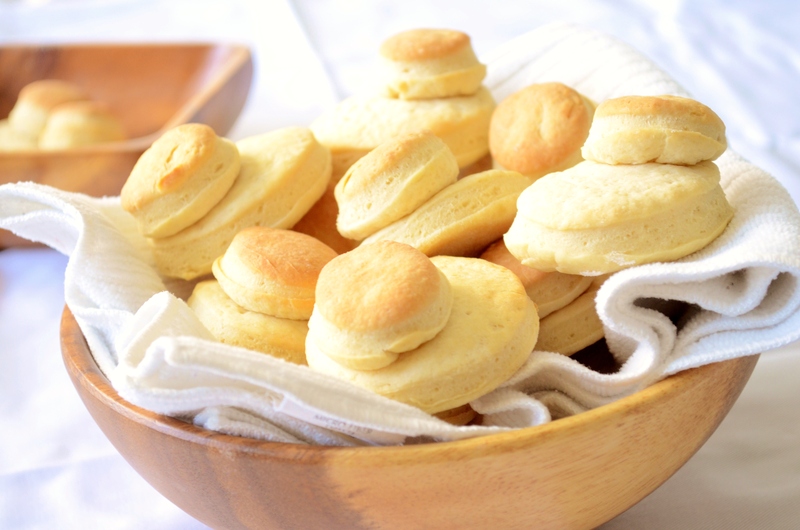 What’s so stellar about this formula is the resulting soft texture and yeast flavor of a fancy dinner roll yet the convenience of the traditional biscuit. Oh and lets not forget to mention how cute and unique the shape is – a tiny replica of a woman’s bonnet. Turns out, these biscuits are rather rare and forgotten pieces of pastry’s history. A search for the original recipe is difficult to find and often leads back to one woman… Mary Midleton. During a visit to her aunt and uncle in Bucks County, Pennsylvania she collected and recorded farmer’s recipes, which one happened to be for Quaker Bonnet Biscuits. In a 1915 book by Edith M. Thomas titled, “Mary at the Farm and Book of Recipes Compiled during Her Visit: among the “Pennsylvania Germans,” Mary’s original recipe was listed and very tough to execute in the modern era. Definitely a formula in need of updating. Since lard is no longer a conventional fat used, an equal amount of butter provided great taste as long as the flour was reduced by half. The original formula also lacked salt and sugar, which when added provided a better taste as long as it was kept to a minimum. Rapid-rise yeast was a necessary transition for a quicker rising time as it is widely available compared to the original cake yeast called for by Mary. Although most bread formulas require two rises to provide a tender, flakiness, it is no longer practical to take so long just to make biscuits when you could grab a tube of pre-made stuff at the store marketed by a white doughboy that’s as cute in his own right as the little bonnets shown here. 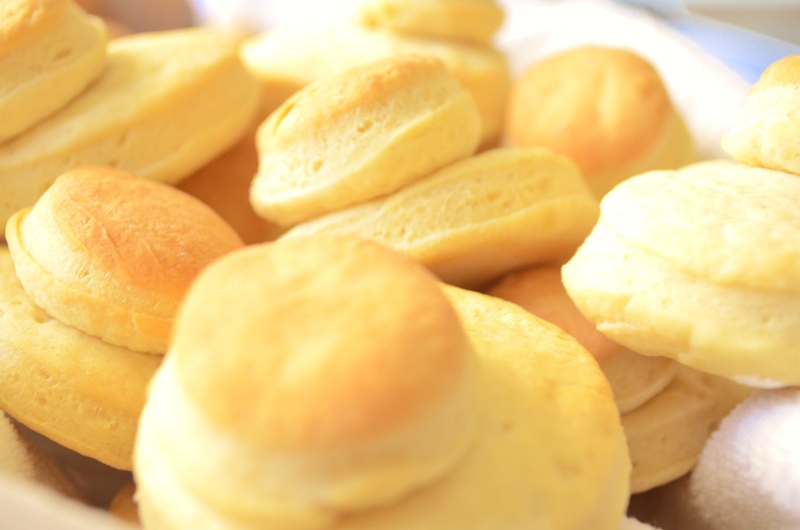 Mary may have had all morning to make her biscuits for dinner but us working mom’s and dad’s need something quick and easy enough to make after work still while watching out for the children as they get more and more rambunctious while waiting for dinner. To make this happen, the traditional first rise is cut out all together, much like a southern yeast biscuit. As soon as the dough is mixed together, rather than allow it to rise for the first time, it is instead quickly rolled out, cut, and then allowed to rise. Once doubled in size it could be baked and on the table all in an hour’s time. 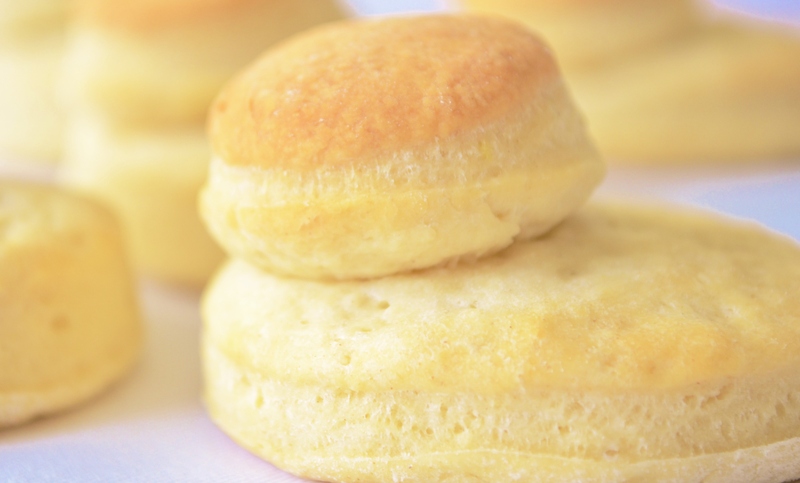 Surely a biscuit recipe worth getting to know in our modern kitchens. Adjust oven racks to upper-middle and lower-middle positions. Heat oven to 200°. Once the oven is preheated, allow temperature to maintain for 10 minutes, then turn off the oven. Heat the milk to 100°-110°. Add the yeast and stir gently until just combined. Allow mixture to bloom a few minutes. Meanwhile, mix the flour, sugar, and salt together in a food processor until combined. Add the chilled butter and pulse until mixture resembles coarse cornmeal, about 15 one-second pulses. Transfer the mixture to a large bowl. Add the egg, milk and yeast mixture to the dry ingredients until the dough comes together. Turn the dough out onto a clean, lightly floured surface. Briefly knead the dough together, about 1 minute. If dough is too wet or hard to work with, add more flour as necessary. Roll the dough into a 12 in. round. Cut out eighteen 2 ½ in. circles that are ¾ in. thick, and place on a parchment-lined baking sheet. Re-roll the remaining dough into a round a ½ in. thick and cut out eighteen 1 ¼ in. rounds. Lightly brush the larger dough rounds with melted butter and place the smaller dough round slightly off center on top of each larger round. Place baking sheets in the warmed oven. Let rise until double in size, about 25-35 minutes. Once doubled in size, remove the baking sheets from the oven and heat to 375°. 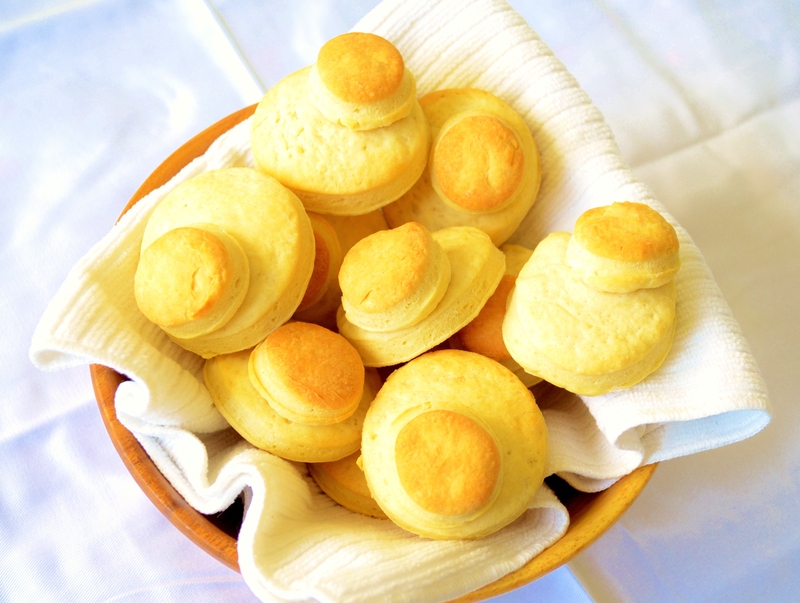 Once the oven is fully preheated, return the baking sheets to the oven and bake until biscuits are golden brown, about 15 minutes. Be sure to rotate the baking sheets halfway through the baking time. 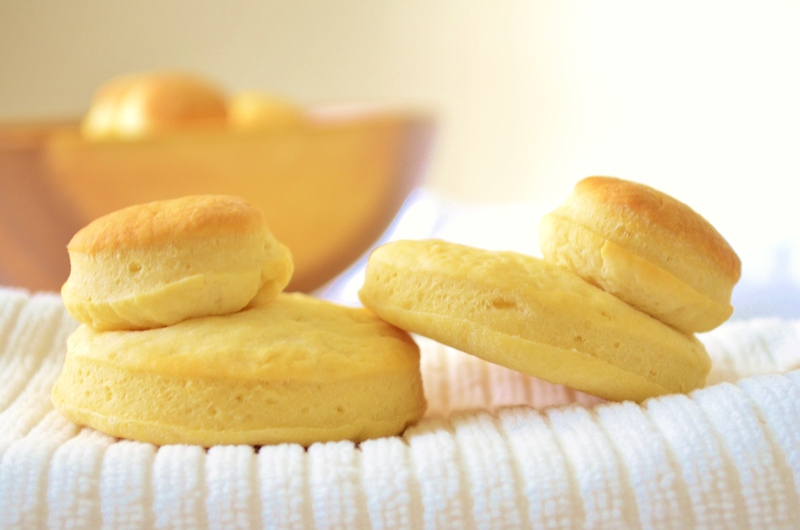 Serve biscuits hot or warm.